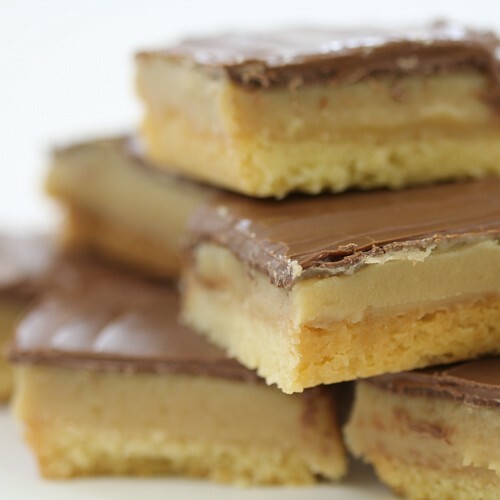 Treat your guests to a freshly baked tin of our delicious Caramel Slice and give them an experience they’ll never forget. 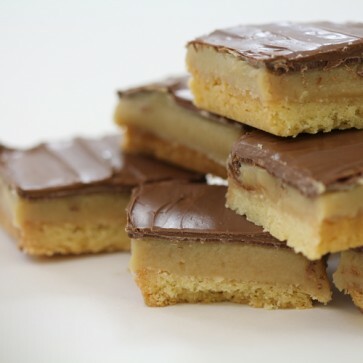 Indulge them in irresistible layers of sumptuous chocolate, soft melt in your mouth caramel and a gorgeous, crumbly biscuit base that will have them coming back for more! Rectangular silver tin of 12 Caramel Slices surrounded in greaseproof paper and wrapped in brown gingham fabric, secured with a chocolate brown bow. Just make sure you get some before they’re all gone! Who can resist the indulgent, classic deliciousness that is a Caramel Slice? Lose yourself in layers of irresistible chocolate, smooth caramel and a delicious, crumbly biscuit base. The perfect addition for any occasion, these timeless classics will always be an instant hit with everyone. Treat your guests to our yummy squares of pure pleasure and make it a party they will never forget. As with all of our baked goods, these delicious treats are handmade with the utmost care and love, so that every tantalising bite you take is unforgettable. Sent by recorded first class post (delivery date estimated only) or by courier for larger quantities.